Introducing Econ, the screensaver that uses your icons! Click on the screenshot to get a nice QuickTime preview of the screensaver. Econ is Leopard-only and requires a decent graphics card & CPU. Update: In Snow Leopard, you need to launch System Preferences in 32-bit mode in order to be able to select Econ from the list of screensavers. To open System Preferences in 32-bit mode, right-click on its icon, choose Get Info and check the Open In 32-bit Mode checkbox. This entry was posted on Monday, November 19th, 2007 at 4:28 pm	and is filed under Apple, Interface, Uncategorized. You can follow any responses to this entry through the RSS 2.0 feed. You can leave a response, or trackback from your own site. good job. 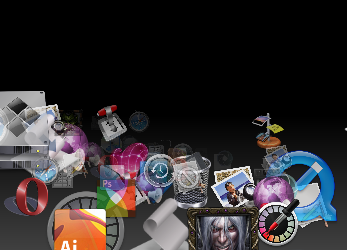 Just that some of my icons not shown in it. If it scanned ~/Applications as well as /Applications i’d love it. This screensaver is chibby !!! This cute screensaver will surely never be available for Tiger, as I suppose it uses Core Animation which is only available for Leopard. Nice saver, I like it thanks. Sometimes I forget just how many little apps I have dotted around that I am never using. One question though, how do you manage to grab a shot of the screensaver before it drops back to the desktop? is included in Mac OS X 10.1 (Puma) - it stays there until 10.1.5, but it gets erased after the Upgrade to X 10.2 Jaguar. That screensaver in Puma, it is 100 % copyrighted and made by Apple, it looks EXACTLY like your screenshot, but runs on any Ati Rage Card with only 16 MB Vram, which were common back in 2001. I would call this Project a shameless ripoff and I will imediately notify Apple to compare this with the screensaver they have made, which was and still is their intellectual property. OS X ( even the very first Beta ) is not anbandonware which one can rip,copy or modify or implement old features into newer editions by claiming that it is “something new”. I installed Econ.saver. Nice! I would like to have influence of speed, number of icons a.s.o. Something in the pipeline? You neglect, of course, the fact that a flying icon screensaver like this is much older than OS X. So it’s not really “Apple’s IP” even though they did offer an implementation several years ago. It’s so old and so obvious that it’s not really ownable. @Sascha - Geez, calm down. It is not exactly the same. The one for 10.1 was actually quite lame. Will you be updating this amazing screen saver to Snow Leopard compatility? thank youuuuuuuu for this awesome screensaver. And for Mario’s comment: It works like a charm on my Snow Leopard. I can’t run this in Snow Leopard, so I hope you’ll soon be doing a new version - it looks great! Sonia, you’re lucky. I can’t get to install the screen saver. Contact the developer of this screen saver for a newer version. Have you done something to make this work? Mario open system preferences in 32-bit mode. But a 64-bit option would be nice. In Snow Leopard, you need to launch System Preferences in 32-bit mode in order to be able to select Econ from the list of screensavers. To open System Preferences in 32-bit mode, right-click on its icon, choose Get Info and check the Open In 32-bit Mode checkbox. Any chance this will be updated for Snow Leopard so that it can run in full 64 bit? Hey, I love this! Thanks. Umm… when I click the download link, it goes to some sort of random website that has nothing to do with this thing. An no download. Please email downloaded file! i very love this screensaver, but can’t use my mac on osx10.6, have a newer ver. ? Thanks! this still wont work with Snow Leopard 10.6.8, any ideas?